Never forget… – Write with us! We all remember where we were. Ten years ago I was working for Abbott managing a team of account managers nationwide. When the attacks occurred, we created a telephone calling tree just to find everyone. There was no Facebook or Twitter back then. I enjoyed my job, but a passion for paper and journals was always in the backdrop. My journal is a place to capture my fears, hopes, darkest secrets, happiest of times, pains, longings, and memories of those I hold dear to my heart. So on Sunday as I watched almost an entire day of television reliving the pains of 9/11/01, I was struggling to find understanding and purpose in the years that followed, for me. You see, I’m no longer with Abbott helping to create drugs for cures. I own and operate a small stationery and pen shop in a small town. 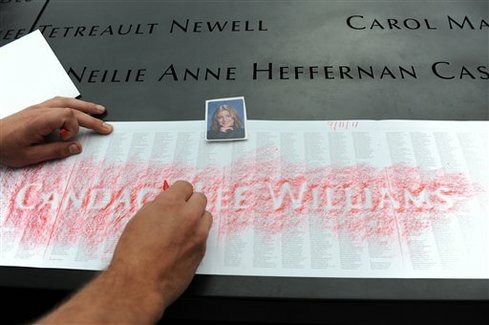 But when the 9/11 memorial opened to family members, it suddenly became clear to me. This place to remember and reflect was not designed with scrolling names on a touch screen. And of all the technology advances they could have employed, the names of those that perished were inscribed, in bronze. Simple letters that form names that are now memories for families that lined the concrete pools searching for solace. In those images I noticed how just seeing a name can draw such emotion in a person. Adults and children touched the letters, they took photographs, some even left flowers. And many were given paper and pencil to trace the names, taking a piece of this memory home with them. Previous Post Did you take your child to college this weekend?